Patrick Swayze Begins Pre-Production on’Ghost’, which is Being Adapted as a TV Series!! Paramount has just re-launched their television department and the first project that has been greenlit is a TV series based on the hit film ‘Ghost‘, which won Oscars more than twenty years ago. Akiva Goldsman and Jeff Pinkner will co-write the pilot episode, which will be a supernatural drama. The original film won Oscars for screenplay and Best supporting actress for Whoopi Goldberg. There is no word yet on who will be cast in the show nor a definitive plot line. 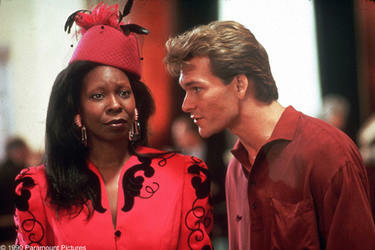 It could take place after the end of Ghost and follow the character Sam Wheat, which Patrick Swayze played to a fine tee and his friendly psychic Oda Mae Brown (Goldberg) who pair up to solve crimes. Or it can completely reboot the film in series form, or completely follow new characters. We will definitely keep you in the loop. I wonder if the theme song will be ‘Unchained Melody’? Your thoughts? This entry was posted on Thursday, November 14th, 2013 at 11:54 pm	and is filed under Film, News, Television. You can follow any responses to this entry through the RSS 2.0 feed. You can skip to the end and leave a response. Pinging is currently not allowed. « Film Review: ‘The Book Thief’!! Why kill you now, Prince of Troy, with no-one here to see you fall?